Luca Damiani and Theresa Cliff-Ryan win the Terrapin Twilight Criterium in Athens, Georgia. Luca Damiani (Kenda-5-Hour Energy-Geargrinder) out-gunned a dominant UnitedHealthcare team in the final moments of the Terrapin Twilight Criterium in Athens, Georgia, to take the biggest win of his career. Damiani had been part of a four-man group that broke away late in the the 31st edition of the race and eventually lapped the field. The Italian rider outsprinted breakaway companion Boy Van Poppel (UnitedHealthcare) by a half a bike length despite UnitedHealthCare’s efforts to control the race throughout. Christian Helmig (Elbowz Racing) finished third. In the women’s event Theresa Cliff-Ryan (Colavita-Forno D’Asolo-Cooking Light) won her second consecutive Terrapin Twilight by getting the better of 2010 USA CRITS champion Erica Allar (RideClean-Patentit). Christina Gokey-Smith (Rouse Bicycles) completed the podium in third. Damiani, Van Poppel, Helmig (Elbowz Racing) and Bissell’s Andrew Dahlheim jumped out of a 12-man break with a half-hour remaining in the 80-lap race. Six laps later, the quartet had lapped the field and essentially sealed a victory for one of them. With UnitedHealthCare’s strength evident throughout the event, the smart money was on Van Poppel. It was Van Poppel’s team that brought back an early troublesome escape by Carlos Alzate (Team Exergy) and Eric Marcotte (SKLZ-Pista Place). With only 16 laps of racing completed the duo was dangerously close to lapping the main field until UnitedHealthCare began the chase in earnest. The squad team time-trialed its way around the 1km course until the breakaway was shut down. Not long afterward a crash disrupted the field, setting free that 12-man group that included what would be the winning four-man breakaway. UnitedHealthCare set up a strong lead out train for Van Poppel, but Damiani was able to surf the remains of the field out of the final turn and find a fast enough wheel to lead him to the finish line. Van Poppel took a close second, and Helmig out-paced Dahlheim for third. Sixty-two riders started the women’s race, but the competition came down largely to two teams — Colavita-Forno D’Asolo-Cooking Light and Rouse Bicycles — and a handful of criterium specialists. Early protagonists included past Twilight winner Rebecca Larson, perennially strong veteran Laura Van Gilder (Mellow Mushroom) and Robin Farina (Rouse Bicycles). “Our sprinter Christina Gokey-Smith motivated us to animate the race, go for primes and sprint points,” Farina said. Just past midrace a crash took down three Tibco-To the Top riders, among them sprinter Sam Schneider and Rebecca Larson. Once things settled down, Colavita fought to create some separation but as the laps ticked down it became clear that a sprint was in the offing. Allar set herself up to make sure she was in the right position. But Cliff-Ryan’s leadout from her Colavita teammates was not to be denied. 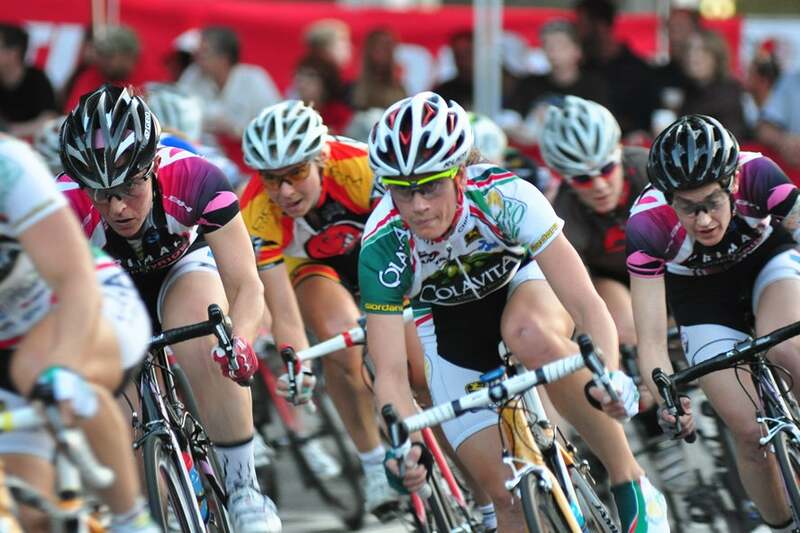 The USA CRITS Championship Series resumes May 14 with the Tour de Grove in St. Louis, Missouri. 2. Erica Allar, Rideclean-Patentit, s.t. 2. Boy Van Poppel, Unitedhealthcare, s.t.